An April day in the morning. April is here but no fools are we! One would imagine that Easter is the obvious choice for April’s Mac Attack Challenge, but as we sat and thought about it, visions of bunnies and eggs in pastel colors floating before our eyes, we realized that not everyone celebrates Easter. But April, that doorway to Springtime, a month of both sunshine and rain, is jam-packed with holidays, from April Fool’s Day (Poisson d’Avril for you Francophiles) on the First all the way to Arbor Day jumping on board the last Friday of the month. And in between we find yes, Easter, but Passover as well – and don’t we love yeast-less, flour-less macarons at Passover? – World Health Day and Earth Day among others. So we have decided to leave the choice up to you! It may be religious or national or something in between, but this month of April, your challenge, should you choose to accept it, is for your macarons to be influenced by an April holiday. Just let us know how your macs relate to a specific holiday. Now, Mac Passionates, go forth and create! Please have your Mac Attack post up no later than April 10 '10. Round up will be on April 15, 2010. ATTENTION PLEASE!!! Do add Mactweets to your RSS feed or sign up for e-mail alerts. This way you will always be in the loop and know as soon as we add a new post, a tutorial or a round up. And, as always, spread the word! Thank you!! I don't do anything special for Easter, but I have noticed evry year when it is Easter time lots of yellow deocrations pop uo in the shops, so i think i will make something yellowish. An Easter weekend project, if I have recovered enough from Round 5! Does anyone know where to get a great violette flavouring? I want one - got one, and it is really bitter. Help? I would lOVE to do violette! You don't have to purchase the entire kit... they sell individually as well! Best of luck! Oh those macaroons looks so good! Hope everyone is having a lot of fun with this month's challenge! 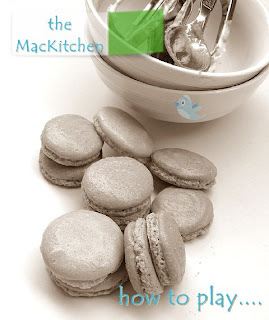 My 'Easter' macarons post is up http://bit.ly/bnnNDI Can't wait to see your creations. Thanks again for hosting this, looking forward to the round-up. Subtle colour, but rich chocolate and raspberry flavours. Thank you for this fun challenge! Look forward to seeing everyone else's creations. Here are my mimosa macarons! Hi, my post is up! Please check 'em out! Thanks for a fun challenge. Silly, silly me. I spent the whole weekend making Macs, planning to post them tomorrow.......cause I thought deadline was 12th. Oh well, will still do it tomorrow. here is my #6 mactweets post! i have this post on hold since easter! silly me! Sorry, I got confused between the 10th (deadline) and the 15th (roundup)! I actually made them before easter but was on holiday last week. Doh! Naughty, naughty me! Finally got them done and posted! I am proud to say that they are the best I have ever made! Like dense brownies! French Easter Chocolate Praline Macs! Better late than never, and another late host! I almost never posted them because I wasn't happy with them. Mardi talked me into posting them last evening (on twitter), so here I am!! I don't understand what have you found in those Mac's, have you watched the "Super Size Me", all types of food that are made in McDonalds is creating you health disorders.